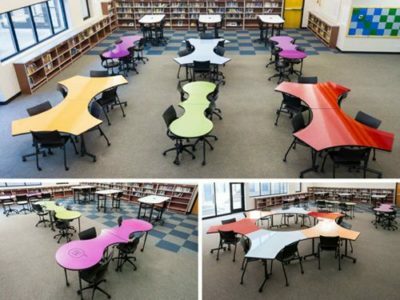 Interior Concepts » Blog » Furniture Design » What is a School Makerspace? A school makerspace serves as a gathering point for creating and exploring. These spaces aid in increasing student engagement and creating an active learning environment. Makerspaces come in all shapes and sizes. In schools, these areas are often found in the computer labs, libraries, or media centers. The idea behind the maker movement is experimental play that engages students. Makers are invited to play with new technology to inspire learning through exploration. Students might take things apart, build, or experiment with new technology. When thinking about school and educational furniture and designing a makerspace for your school the goal is to balance social interaction with individual exploration. It’s a delicate balance to provide large work areas with individual workspaces, while keeping students close enough together so they can inspire each other with ideas. We know that learning can happen anywhere. Makerspace areas, STEM labs, and 21st century classrooms are areas that a dedicate a physical space in the school to introduce students to new technology and exploration that can help to ignite a passion for learning. Every makerspace will be different, and the important thing is just to get started. For more information on school makerspaces check out the ebook from Maker Media via the link below. 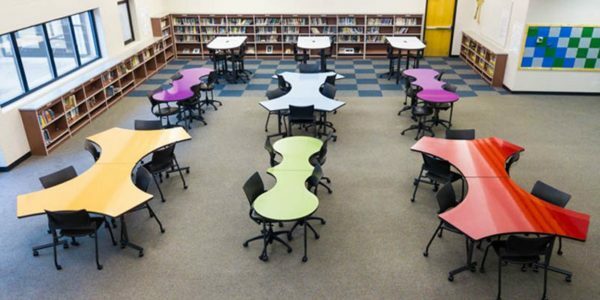 If you are interested in learning more about furniture options for your makerspace, check out media center furniture and unique shape table options. (2013). Makerspace Playbook: School Edition. Maker Media. Retrieved from http://makerspace.com/wp-content/uploads/2013/02/MakerspacePlaybook-Feb2013.pdf.